The Neoya Team have created a very stylish multi-purpose USB cable that they have launched over on the Kickstarter website this week looking to raise $20,000 in pledges to help it go into manufacture. 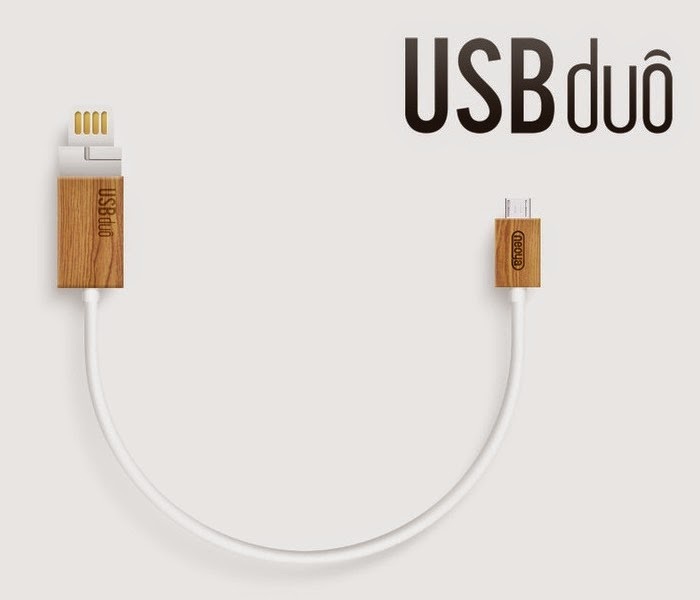 The USBduo takes the form of a wooden ended USB cable for smartphones, tablets and PCs that is equipped with a reversible USB connector together with a dual head flash drive and card reader. “In this smartphone era, smartphones are everywhere and most of us have at least one USB cable at hand. However, as one of the most important accessories, the USB cables not only function the same but look the same. “Why can’t USB cables be more special?” We were struck by this simple thought and began to think what makes a special USB cable. We suppose a special USB cable should have substantial advantages in its material, design, and functions. Through countless times of design, test, heated discussion and redesign, the USBduo is the final outcome of the team, a USB cable that is special to look, to feel and to use. We adopted wood material and minimalist design on the USBduo. It not only has reversible USB connectors but it functions both as a dual-head flash drive/card reader and a USB OTG cable connecting smartphones to USB devices.